Our mission is to bring the highest quality hands-on experiential learning to kids everywhere. You can help us reach more kids and create deeper and richer experiences by donating. Tinkering School is operated by the Institute for Applied Tinkering, a 501(c)3 non-profit organization with the Tax ID of 26-4299346. All donations are tax-deductible. Sustaining and recurring donations are one of the most powerful ways you can donate. Predictable income will allow us to say yes to bigger more ambitious projects that reach increasingly diverse populations. One time donations are a fantastic way to give right now. Give any amount at anytime. Check out the kinds of experiences you will be helping to create. Long time tinkers participate in master class. 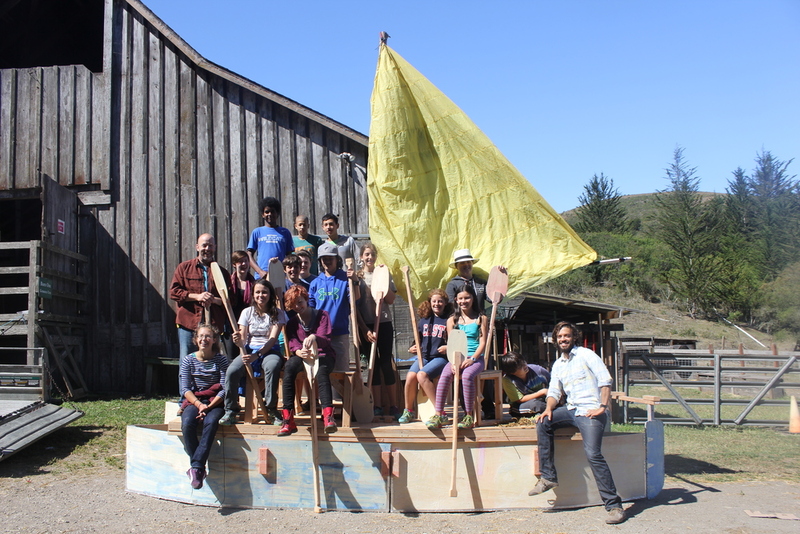 This group of kids ages 10-17 came together to build a pontoon boat for the whole camp. We sailed it for 4 hours in the harbor. Our welding workshops start as young as 9 years old. They are deeply empowering workshops where every kids leaves with a piece they designed and welded. 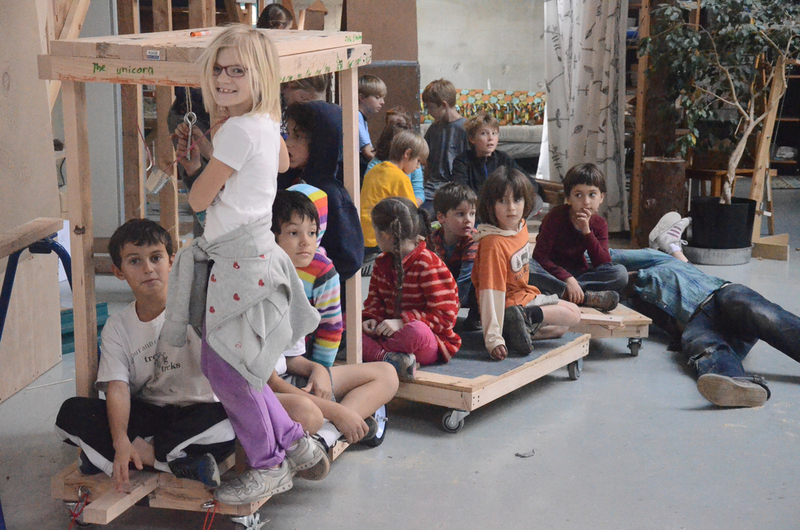 The kids build a train on casters in just one day. Henry stands tall over out 8ft monster. Just hours after this photo the monster would go smashing through our cardboard city in an epic conclusion to the week. One of our best one day workshops. We built a giant robot with big moving arms that gave people flowers. A very focused girl drills. 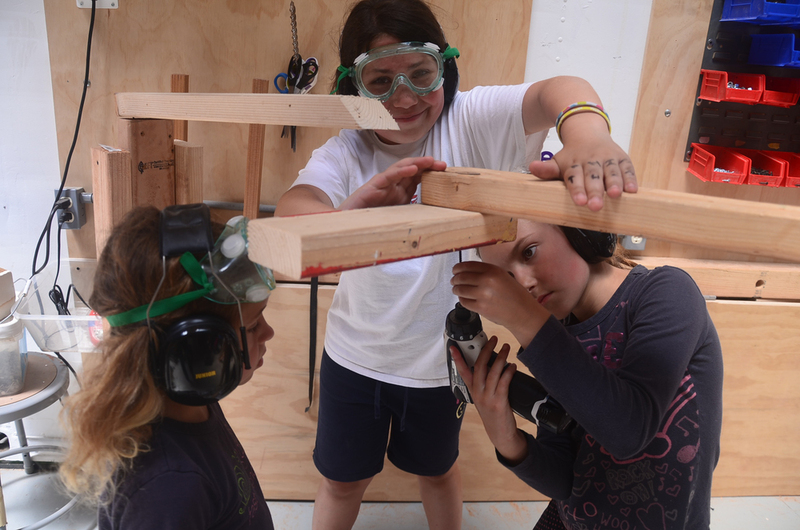 Several girls and one boy work together to build something. A teen inspects his work in the finals tests of a Rube Goldberg machine. A kid cleans up the edges using a router. A younger camper at the day camp, 5 years old, puts two pieces of wood together. A very focused boy uses the drill press to drill perfectly straight holes. At Tinkering School, flow is a thing we deeply value. Here a young girl achieves serious flow. Kids us an unorthodox system to finish a piece as the deadline looms. One of our campers activates the lava during a run of our home made obsticle course. In an after-school workshop kids brought the toaster to its base elements and tried to make one from scratch. Kids will always find a way to make a happy face. With nails was not one of the ways we expected. 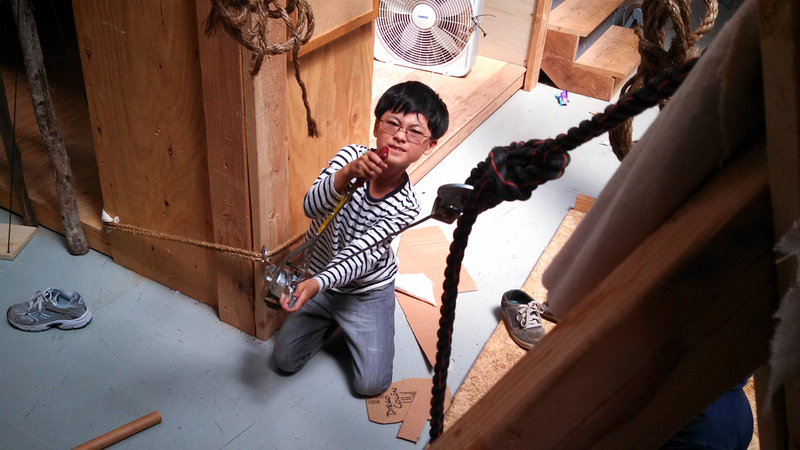 a boy tightens up the winch to keep our robe bridge taught. every project starts with a drawing. This week we where building a 17 person pontoon boat. This drawing attempts to solve the seating problems. In an attempt to make the best carts Tinkering School has ever seen, the teens get creative around stearing functionality. A female tinkerer cuts up a paragliding parachute for the sail of a pontoon boat. Gever Tulley, our founder, takes the helm as we sail through the harbor on a pontoon boat we built in a week. 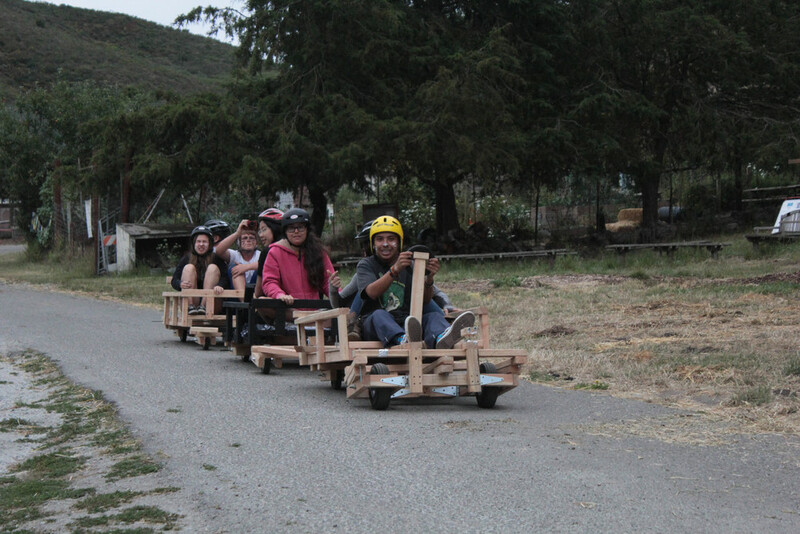 Our oldest tinkerers ages 14 and up work on a down hill cattle car. Only the front car can steer. Only the back cars and break. Want to volunteer? Have some really interesting materials? Some tools you'd like us to have? reach out to info@tinkeringschool.com and we can work out the details.